The Maria Holder Memorial Trust is ensuring that every child in Barbados gets a chance at early childhood education. 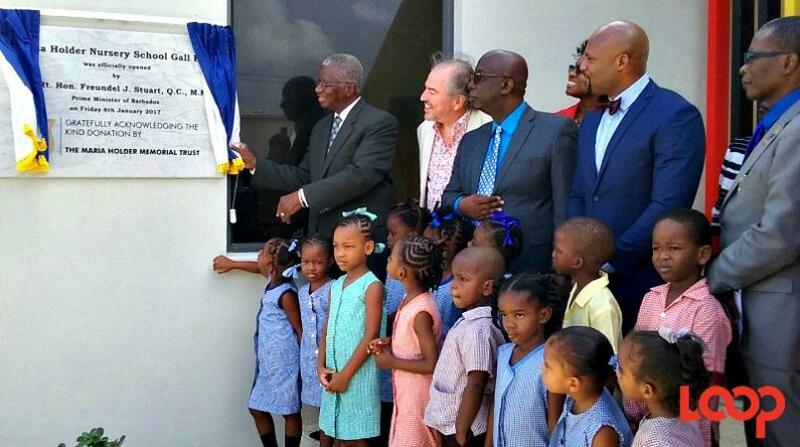 Six days into the New Year, the first of six state-of-the-art nursery schools funded by the Trust, was officially opened by Prime Minister of Barbados, Freundel Stuart. Located on Lot #2 Church Hill Road, Gall Hill, Christ Church, the school has a capacity for 150 children and has been designed by high specifications on order to provide a state-of-the-art and durable environment for nursery education. Chairman and Co-founder of the Trust, Christopher Holder, says the facility, which was officially opened to students in September 2016, is among the six that are being constructed to assist the Government in providing universal nursery education. He disclosed that the second school at Oldbury, St. Phillip will be completed on January 13 and 90 students will enter at the end of January. The next two schools at Government Hill, St. Michael and at Holders Hill, St, James will start construction sometime in 2017, while the last two schools at Sayers Court, Christ Church and Deacons, St. Michael are set to begin construction in 2018 to enable completion of the project in 2020. Mr Holder says the trust will also have trained 75 Nursery teachers by June 2017 through a link with Wheelock College in Boston. “This training also includes Special Needs Education and some of these teachers are already deployed in the new schools and some of them are in this school,” he said. The School opened two years after its ground-breaking ceremony took place on December 18, 2014. It is a collaborative project with The Ministry of Education and is solely funded by The Maria Holder Memorial Trust.